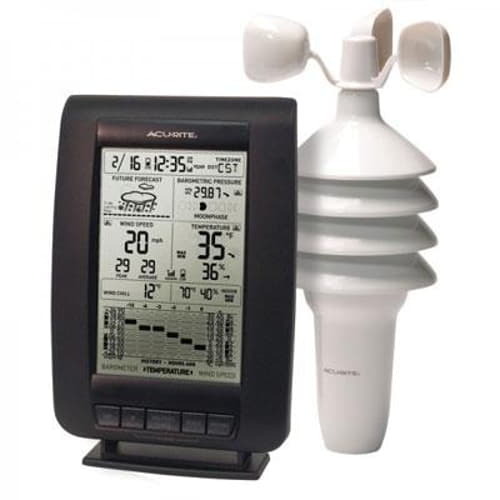 The AcuRite Professional Weather Station uses patented Self-Calibrating Technology to provide your personal forecast of 12 to 24 hour weather conditions. Self-Calibrating Forecasting is generated from weather data measured by a sensor in your yard - giving you the most accurate forecast available for your exact location. 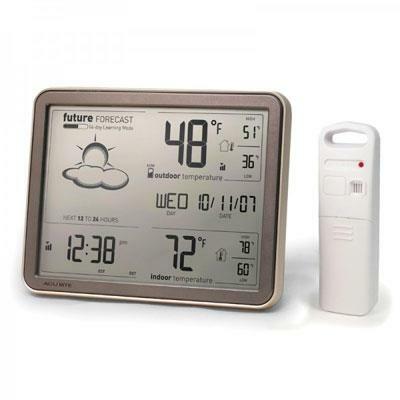 The display with PC Connect plugs into your PC to provide your weather information in a data (CSV) file as a PC widget or online. View your sensors from virtually anywhere on a smartphone tablet or computer with the AcuRite app and myAcuRite.com website or easily publish your weather reports on Weather Underground. The illuminated color LCD display includes indoor / outdoor temperature and humidity wind speed / direction / chill rain barometric pressure clock calendar and more. Personalize the Weather Ticker to stream the information you want. Programmable alarms alert you when weather conditions change. 12 to 24 hour weather forecast. 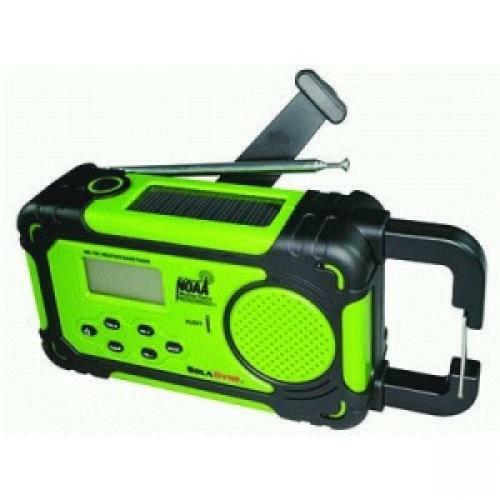 Wind speed: current peak and average (MPH or K This item cannot be shipped to APO/FPO addresses. Please accept our apologies. 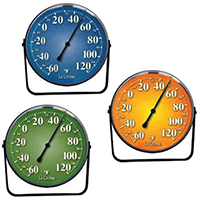 HEAT INDEX & WIND CHILL THERMOMETER Full view thermometer Features color illustrations Design created for maximum visual impact 90078 13.25 IN. 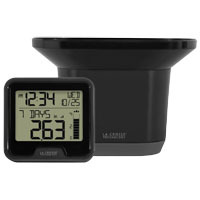 HEAT/WIND CHILL SIZE:13.25"
The AcuRite Color Weather Station. Plan the day with confidence with your own weather and weather prediction information - pinpoint accuracy right from your own backyard. 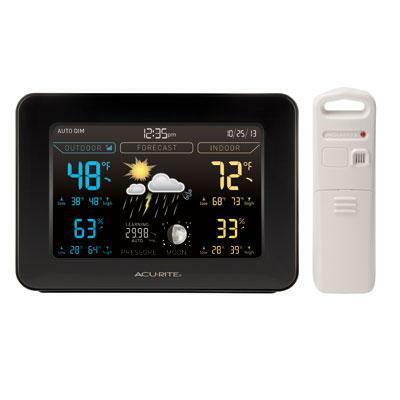 The AcuRite Color Digital Weather Station uses patented Self-Calibrating Technology to provide your personal forecast of 12 to 24 hour weather conditions. Self-Calibrating Forecasting is generated from weather data measured by a sensor in your yard - giving you the most accurate forecast available for your exact location. Illuminated color display with auto-dimming brightness. 12 to 24 hour weather forecast. Patented Self-Calibrating Forecasting pulls data from a sensor in your backyard to give you the most accurate forecast for your exact location. Indoor / outdoor temperature ( F or C) with trend arrow. Indoor / outdoor humidity (%RH) with trend arrow. Daily high/low data and all time high/low records with time stamp. 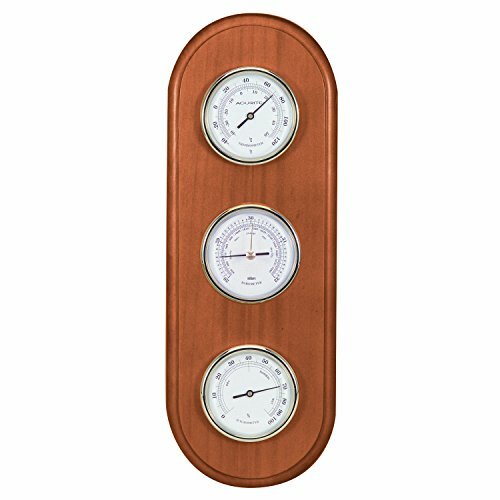 Barometric pressure with weather trend indicator arrow and manual calibration feature. Moon phase. 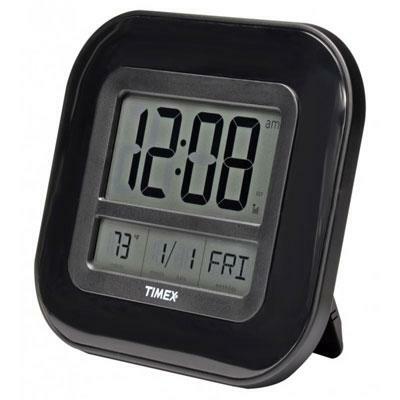 Intelli-Time clock & ca This item cannot be shipped to APO/FPO addresses. Please accept our apologies. 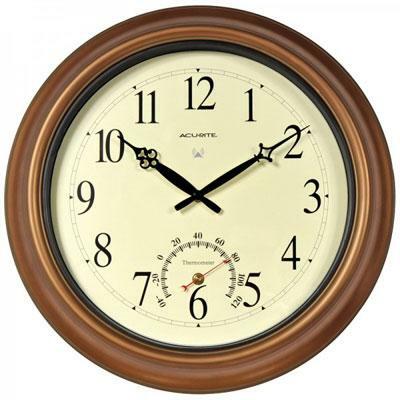 Acu Outdoor RCC Clock Copper 18" Acu Outdoor RCC Clock Copper 18"
Chaney / AcuRite 18" Indoor or Outdoor Copper Wall Clock features atomic time and precise reliable temperature readings. 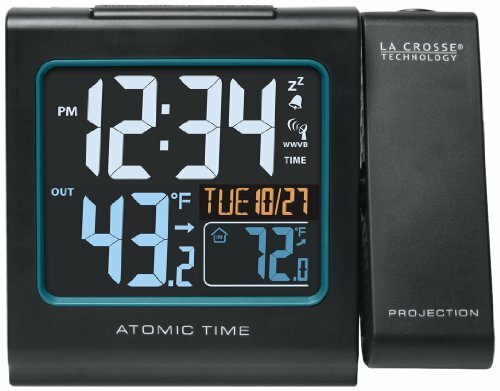 Atomic clock is radio-controlled to maintain the correct time with split-second precision and automatically adjust itself for daylight saving time (DST). Durable weather-resistent copper metal construction is suitable for all seasons - indoor or outdoor use. Includes an integrated hang hole for easy wall mounting. One-year limited warranty. This item cannot be shipped to APO/FPO addresses. Please accept our apologies. The WeatherHawk WM-350 hand held wind meter is a comprehensive weather monitor that measures a full range of environmental data specific to your location. It includes a 48-hr visually displayed bar graph for every function, hour-by-hour. The USA-made fluxgate compass reads when held vertically, gives wind direction in degrees and compass points; and it calculates crosswind, head/tail wind. The compass can be calibrated for variation, declination and deviation. In addition to wind speed and direction, temperature, barometric pressure, altitude, and humidity, the unit includes Wind Chill, Wet Bulb, Dew Point, Delta T and Density Altitude. WM-350 provides an audible storm alarm that alerts you to weather changes, even if the unit is off. The unit includes the AccuWeather Comfort Index and it can be adjusted based on sun intensity to provide a superior human based "feel" for Heat Index. WM-350 can be tripod-mounted and accommodates the Model SM-WT wind tunnel accessory for very precise wind measurements. 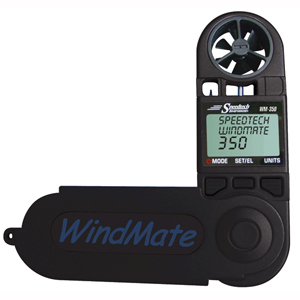 All WindMates are designed with a wind speed accuracy of better than +/- 3% and have a 2-Year warranty. 00638A2 - Chaney / AcuRite Digital Weather Center uses patented Self-Calibrating Technology to provide your personal forecast of 12 to 24 hour weather conditions. Self-Calibrating Forecasting is generated from weather data measured by a sensor in your yard - giving you the most accurate forecast available for your exact location. The bold easy to read LCD screen includes indoor / outdoor temperature and humidity with daily high /low information heat index wind speed / chill multi-variable history chart moon phase atomic clock and calendar. Atomic clock and calendar are radio-controlled to maintain the correct time and date with split-second precision and automatically adjust for daylight saving time (DST). Display stands upright for tabletop use or is wall-mountable. The wireless outdoor sensor features 3 different technologies in one easy-to-mount unit: thermometer hygrometer wind speed anemometer. One-year limited warranty. This item cannot be shipped to APO/FPO addresses. Please accept our apologies. 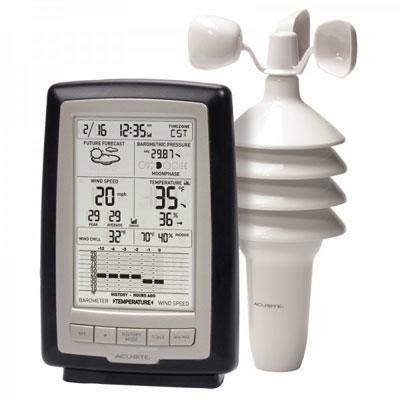 Chaney / AcuRite Digital Weather Station with Forecast/ Temperature/ Atomic Clock uses patented Self-Calibrating Technology to provide your personal forecast of 12 to 24 hour weather conditions. Self-Calibrating Forecasting is generated from weather data measured by a sensor in your yard - giving you the most accurate forecast available for your exact location. The bold easy to read LCD screen includes indoor / outdoor temperature with daily high / low readings and an atomic clock and calendar. Atomic clock and calendar are radio-controlled to maintain the correct time and date with split-second precision and automatically adjust for daylight saving time (DST). Display stands upright for tabletop use or is wall-mountable. The outdoor sensor features powerful wireless technology weather-resistant construction and an integrated hanger for easy mounting. One-year limited warranty. This item cannot be shipped to APO/FPO addresses. Please accept our apologies. 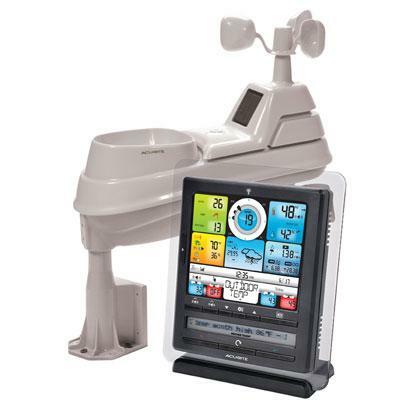 5-in-1 Color Weather Station. Plan the day with confidence with your own weather and weather prediction information - pinpoint accuracy right from your own backyard. The AcuRite Professional Weather Station uses patented Self-Calibrating Technology to provide your personal forecast of 12 to 24 hour weather conditions. Self-Calibrating Forecasting is generated from weather data measured by a sensor in your yard - giving you the most accurate forecast available for your exact location. The illuminated color display features three different lighting settings ensuring you can easily read the information you want at a glance. Select a lighting preference manually or choose auto dim mode. In auto dim mode the display automatically adjusts its brightness based on time of day and year. The high-precision 5-in-1 weather sensor accurately measures five different conditions including rainfall wind speed and wind direction outdoor temperature and humidity giving you comprehensive data about the elements surroun This item cannot be shipped to APO/FPO addresses. Please accept our apologies. 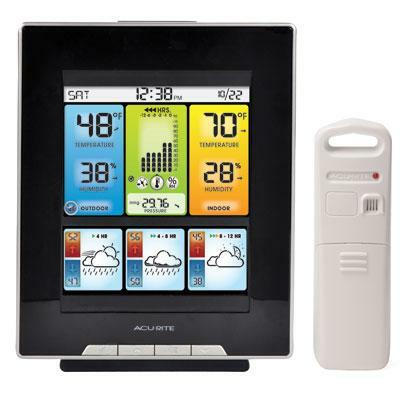 The AcuRite Color Weather Station with Morning Noon & Night Forecast. Plan the day with confidence with your own weather and weather prediction information - pinpoint accuracy right from your own backyard. 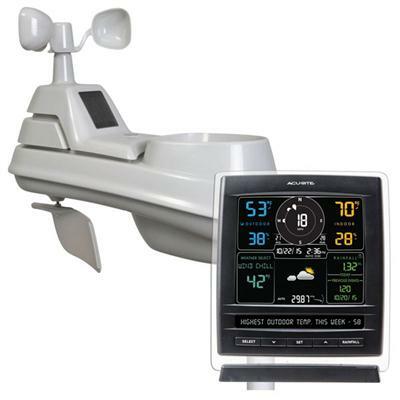 The AcuRite Digital Weather Station uses patent-pending Precision Forecasting to provide your personal forecast of morning noon & night (4-hour 4 to 8-hour and 8 to 12-hour) weather conditions. Precision Forecasting technology combines North America's regional weather patterns with data measured by a sensor in your yard to generate the most accurate forecast available for your exact location. Illuminated color display. 4-hour 4 to 8-hour and 8 to 12-hour Precision Forecast of high and low temperatures cloud cover and precipitation. Patent-pending Precision Forecasting Technology pulls data from your yard to generate the most accurate forecast for your exact location (North America only). Indoor and outdoor temperature (degrees Fahrenheit and Celsius) with trend arrow. 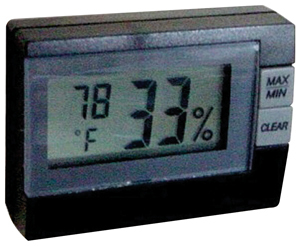 Indoor and outdoor humidity (%RH) This item cannot be shipped to APO/FPO addresses. Please accept our apologies. 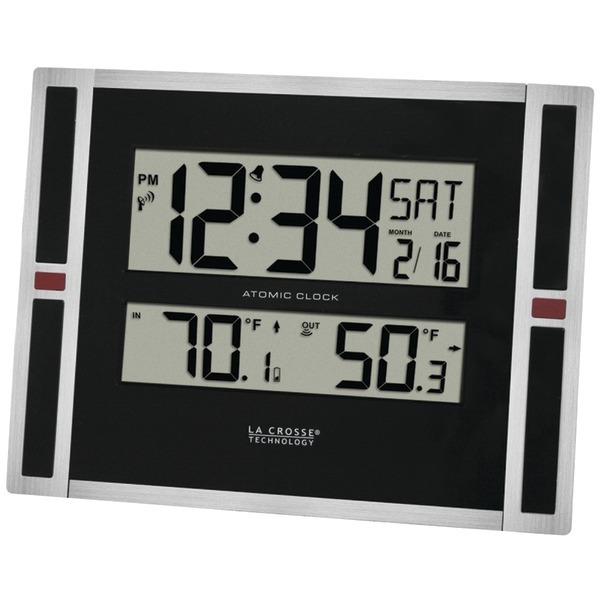 Chaney / AcuRite 9" Timex Atomic Digital Time Temp & Date Wall Clock features a self-setting atomic clock calendar and precise reliable temperature readings. Atomic clock sets itself to the correct time with split-second precision and adjusts itself for Daylight Saving Time (DST). 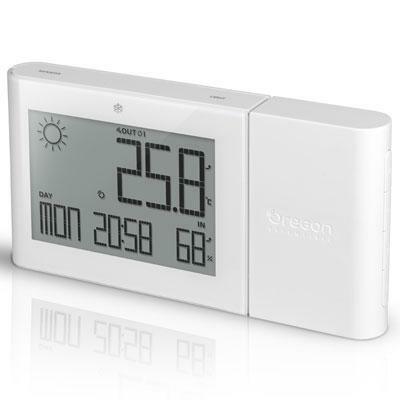 The large easy to read LCD screen displays a calendar (month /date/ day) time (hour/ min) and indoor temperature (F/C selectable). The stylish glossy piano black display stands upright for tabletop use or is wall-mountable. One-year limited warranty. This item cannot be shipped to APO/FPO addresses. Please accept our apologies. 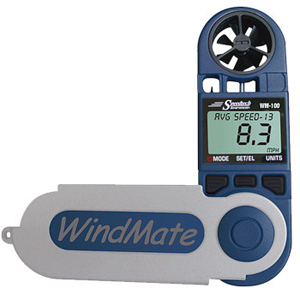 If you just need wind speed, this is the handheld wind meter for you! WM-100 includes a wind vane to assure correct alignment to the wind axis. 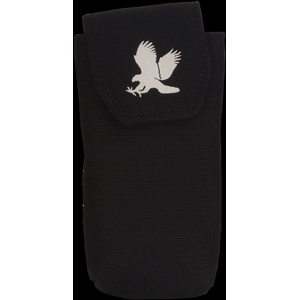 The jackknife case allows more precise wind speed readings because the users hand is distant from the wind impeller, which then measures undisturbed air flow. 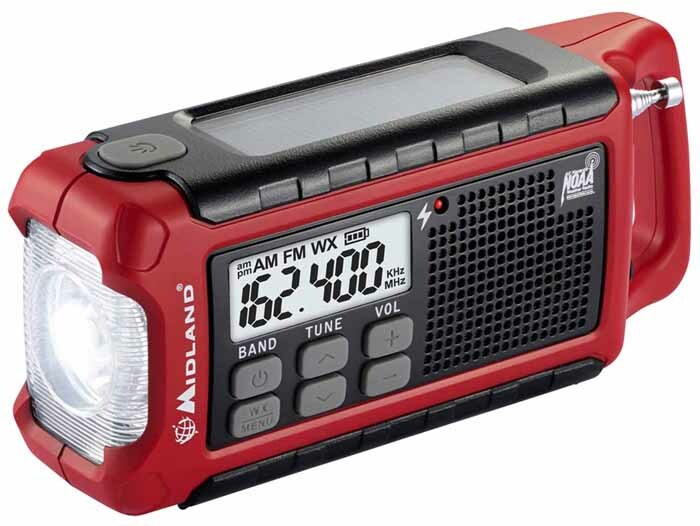 WM-100 has Swiss-made impeller components, is water resistant and shockproof. For long-range shooting, the unit can be tripod-mounted and uses the optional wind tunnel, Model SM-WT for very precise measurements. 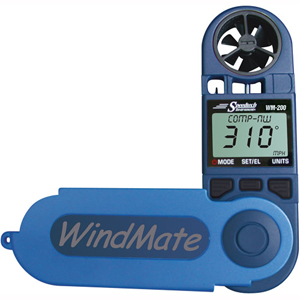 All WindMate wind meters are designed with a wind speed accuracy of better than +/- 3% and have a 2-Year warranty. 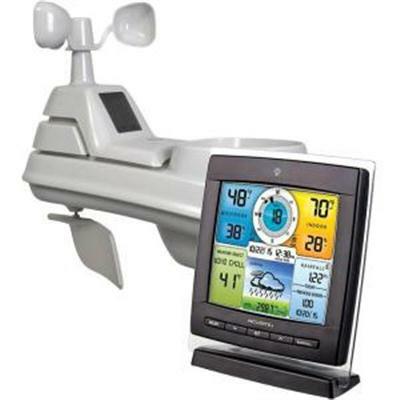 00634A2 - Chaney / AcuRite Digital Weather Center uses patented Self-Calibrating Technology to provide your personal forecast of 12 to 24 hour weather conditions. Self-Calibrating Forecasting is generated from weather data measured by a sensor in your yard - giving you the most accurate forecast available for your exact location. The bold easy to read LCD screen includes indoor / outdoor temperature and humidity with daily high /low information heat index wind speed / chill multi-variable history chart moon phase atomic clock and calendar. Atomic clock and calendar are radio-controlled to maintain the correct time and date with split-second precision and automatically adjust for daylight saving time (DST). Display stands upright for tabletop use or is wall-mountable. The wireless outdoor sensor features 3 different technologies in one easy-to-mount unit: thermometer hygrometer wind speed anemometer. One-year limited warranty. This item cannot be shipped to APO/FPO addresses. Please accept our apologies. WM-200 has an integral, visual wind vane to assist with orientation to the wind, a USA-made fluxgate compass for digital wind direction measurement, and it calculates crosswind, head/tail wind readings. Unlike traditional compasses, the WM-200 reads when held vertically and it can be used to take a bearing on a distant reference point. Temperature and wind chill are included to make this a comprehensive unit for sailors, shooters, and radio-controlled flyers, among many other applications. WM-200 can be tripod-mounted and accommodates the Model SM-WT wind tunnel accessory for very precise wind direction measurements. All WindMates are designed with a wind speed accuracy of better than +/- 3% and have a 2-Year warranty. 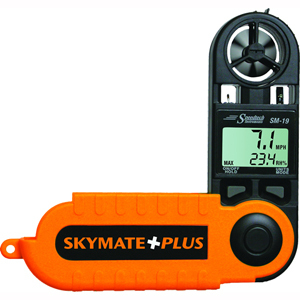 Skymate Plus has all the wind features of the SM-18 plus an accurate hygrometer for relative humidity and dew point. The Honeywell humidity sensor is easily recalibrated. The SkyMate Plus is a competitively priced instrument designed for agriculture and forestry professionals. For the most precise measurements, it can be used with the optional wind tunnel, Model SM-WT; or tripod mounted using the optional tripod mounting fixture. 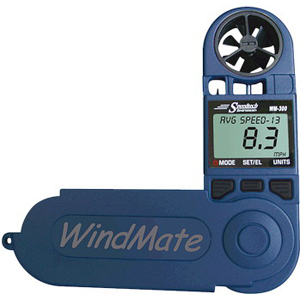 SM-19 wind meters are designed with a wind speed accuracy of better than +/- 3% and have a 2-Year warranty. 5-in-1 Color Weather Station. Plan the day with confidence with your own weather and weather prediction information - pinpoint accuracy right from your own backyard. The AcuRite Professional Weather Station uses patented Self-Calibrating Technology to provide your personal forecast of 12 to 24 hour weather conditions. Self-Calibrating Forecasting is generated from weather data measured by a sensor in your yard - giving you the most accurate forecast available for your exact location. The illuminated display features three different lighting settings ensuring you can easily read the information you want at a glance. Select a lighting preference manually or choose auto dim mode. In auto dim mode the display automatically adjusts its brightness based on time of day and year. The high-precision 5-in-1 weather sensor accurately measures five different conditions including rainfall wind speed and wind direction outdoor temperature and humidity giving you comprehensive data about the elements surrounding y This item cannot be shipped to APO/FPO addresses. Please accept our apologies. Easy-to-read LCD display. Strong suction cups cling to windows. Weather resistant exterior. Uses a watch battery. 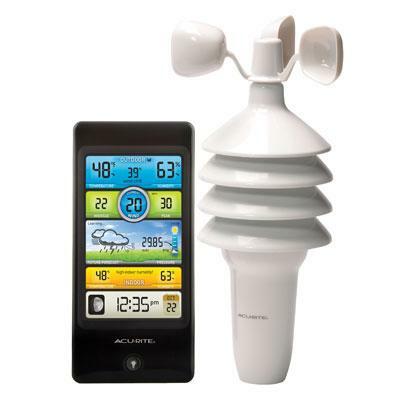 The AcuRite Pro Color Weather Station with Wind Speed. Plan the day with confidence with your own weather prediction information - pinpoint accuracy right from your own backyard. The AcuRite Pro Weather Center uses patented Self-Calibrating Technology to provide your personal forecast of 12 to 24 hour weather conditions. Self-Calibrating Forecasting is generated from weather data measured by a sensor in your yard - giving you the most accurate forecast available for your exact location. Illuminated color display with auto-dimming brightness. 12 to 24 hour weather forecast. Patented Self-Calibrating Forecasting pulls data from a sensor in your backyard to give you the most accurate forecast for your exact location. Wind speed: current low peak and average (MPH or KPH). Indoor and outdoor temperature (degrees Fahrenheit and Celsius) with trend arrow. Indoor and outdoor humidity (%RH) with trend arrow. Humidity level icon indicates high low or ideal indoor conditions. Heat index wind chill and dew point. This item cannot be shipped to APO/FPO addresses. Please accept our apologies. 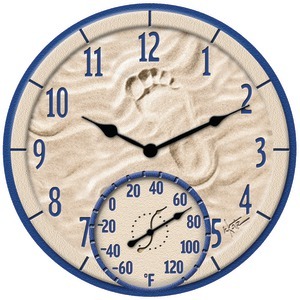 Weather-resistant resin for indoor/outdoor use; Vibrant colors are fade- & UV-resistant; Precision-made thermometer coils; �F scale only; Quartz clock movements for accuracy; Requires 1 AA battery; 14"